Where to begin...I will start by reporting that Nome is now sunny after raining 27 days straight! The gold dredgers are ecstatic to be able to work again, as the fierce waves have also subsided. Goldenrod was designed to be a dredge that doesn't require divers. Instead, a mechanical arm (made from a backhoe arm and bucket) was mounted to the front of Goldenrod with two camera led suction hoses attached for vaccuming where the arm digs. Our team was immediately informed by experienced dredgers in Nome that our system is too complex and would be fraught with problems. The Goldenrod crew simply needed to see and experience that for themselves, as a great deal of mental and physical effort had gone into the design and building of the mechanical arm (not to mention costs). It was the primary dreamchild of our crew's Nome Project. What a concept; not to have to actually get into the frigid water to mine for gold. After repairing the arm once agin recently, the Goldenrod crew went out dredging to discover that it is simply NOT going to work. Although the arm is functioning beautifully, what has been occuring is that during the digging and rock moving process with the arm, the dredge shifts upwards of 15 feet away from where the suctioning needs to take place, despite the dredge being heavily anchored from both sides and from the back. Our team isn't able to keep the boat from moving in the water during dredging. Previous Nome dredgers have attempted the similiar mechanical arm operations, also to no avail. After serious thought, the crew's executive decision was made to get rid of the mechanical arm, and to redesign Goldenrod to be a hookah dive dredge. 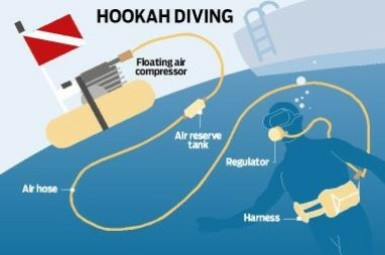 Divers are better able to determine where to move rock, and where to suction for gold on the seafloor. It is the PROVEN method of getting gold off the seafloor in Nome. Every minute counts in Nome, and our crew made a huge sacrifice for the success of the operation. My brother, Tommy, plans to suit up tomorrow for his first Bering Sea gold diving experience. He is an experienced and certfied scuba diver, which will certainly help to improve his underwater comfort level. He is uber excited to get down there, move a lot of rock and suction seafloor sand down to the depth of around 1-1.5 ft (to bedrock, where most of the gold is). This season Steve and Shawn Pomrenke's crew is on the gold with their best season ever. One of our leases is in that same general area, so that's where our crew will be spending the next several weeks. Here's wishing our crew luck and to Tommy for safety while diving! The way you keep "on station" is like the Rose - with 'spuds'. Even the small fishing boats here in the Gulf states use a small 'spud' to hold their boat rather than an anchor with allows the boat to move around. Thanks for sharing your experience... looking forward to the next chapter. You said the Rose had with ONE clean up greater than 1200 ounces. I think you mean for the season the Rose has produced 1200 ounces? Wrong? ONE CLEAN UP OF 1200 ounces? Which is correct? That is recent news in Nome about the 1200 ounce one-time clean up. Yep. Jumbo size it for your suction barge and the Bering Sea. I will pass this info along. I know that Pomrenke uses barge appropriate 'power poles' for the Christine Rose. If I have a guess, weight would be an issue for Goldenrod. Our crew has just removed 2,500 lbs from her frame, and she is moving much more easily and at a more comfortable depth in the water, according to my Father. When gross boat weight (lack of freeboard) becomes a problem it means you are about to run out of reserve buoyancy and now your alternative is to consider expensive aluminum, removing things else adding another pontoon or ? But sometimes that is what it comes down to. Its so easy to sit here and make suggestions and comments - please don't take it wrong - I'm trying to offer suggestions for consideration in hopes a light bulb idea turns on and it can make a difference... else you can click ahead to new content. ONE CLEANOUT - OMG!!! Bet it was the biggest in the Pomrenkes lifetimes. Sure makes the price they paid for their claim all worth while. All of your comments are always welcomed and appreciated. Apparently, there was one boat between Goldenrod and Polar Bound in the Harbor. That's too bad about the mechanical arm. It's a great concept in ideal Nome conditions, but this year was far from ideal. Any swell with that type of system will just cause more problems. That dredge should be a material moving machine now, with two divers and two 8” nozzles going. I have a couple of links for you. Not sure if you've seen these or not??? Hello. We plan to start with one diver and make sure all is 'swell' with the system and such. Next year we will be switching out to one 10" nozzle with the material being equally dispersed into both sluice boxes. For now, we had to connect the two 8" hoses we had (to allow for my brother (Tommy) to have maximum stretch. In order for us to have two divers this year we need another long 8" hose, another hookah system and, most importantly, an experienced and trustworthy diver. Thanks for the links. I hadn't seen the first one. How deep are diver allowed to go in the baring sea?? ?